At BrightStar Care®, we take a unique approach to decreasing fall risk by pairing our unmatched clinical expertise with key patient education resources to help and empower families. Our RN Director of Nursing provides medication oversight. Read more. Our RN performs a comprehensive health assessment, including evaluation of fall risk, for every client. Read more. Individualized plans of care can use creative methods to help clients stay active and build strength and balance. Read more. We actively strive to meet Joint Commission National Patient Safety Goals by identifying environmental fall hazards. Read more. Our Caregivers are competency verified to care for people with chronic conditions. Read more. Elderly fall prevention is more critical than ever before to families. Each year, one in every three adults age 65 and older falls and the results can be life-altering. At BrightStar Care, most of our clients are identified as being at risk of falling for a number of reasons. That's why we've developed our "Focus on Falls" fall prevention program, a unique solution that pairs our clinical expertise and patient education for family caregivers to reduce fall risk by managing chronic conditions, monitoring medications and helping to address other top causes of falls in seniors. At BrightStar, our approach to reducing fall risk is rooted in our unparalleled clinical expertise. Each of BrightStar Care's independently owned and operated locations are required to pursue Joint Commission accreditation, a nationally recognized mark of quality. In accordance with our Joint Commission commitment to National Patient Safety Goals, we relentlessly track falls that occur both when we are and are not present and perform analysis on all falls that do occur to determine what could have occurred to prevent it to better care for our clients and to reduce the likelihood it will occur again. 1. Medication interactions. Remind your loved one to take their medication or enlist a licensed agency to can help with medication management. Pill reminder boxes can also help. Be sure to ask their doctor or pharmacist to review their medications - both prescriptions and over-the-counter - to identify medicines that may cause side effects or interactions. BrightStar RN Directors of Nursing can provide medication oversight and work with you to on strategies to stay on track with taking medications. 2. Weakness, fatigue and illness. 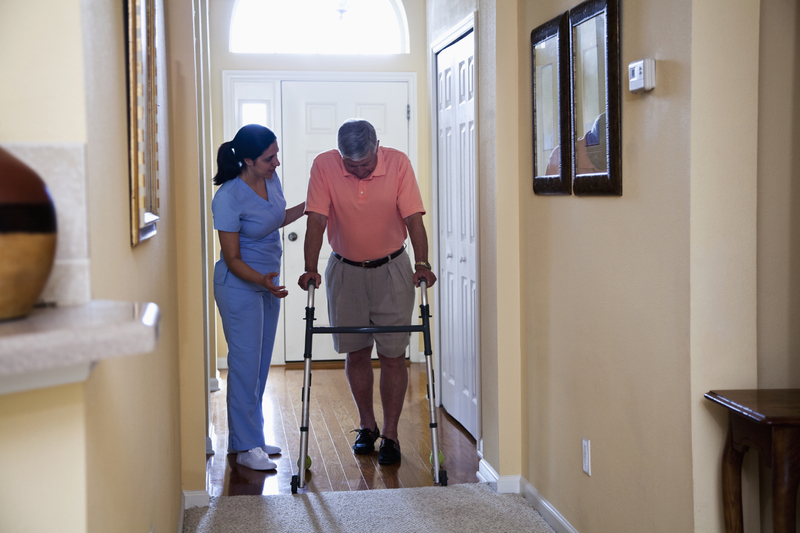 If your loved one is weak, tired or ill, help them get out of bed to go to the bathroom and walk around or enlist a licensed agency to provide them with this support in getting around. Encourage adequate intake of food and fluids to maintain protein stores and prevent dehydration. Individualized plans of care often promote staying active and can even include exercises - like bending, stretching and other targeted movements - supported by experienced BrightStar caregivers. And our RNs conduct Fall Risk Assessments for every client to ensure any and all risk factors are addressed as part of the plan of care. 3. Lack of physical strength, balance. A loved one who has fallen before, even if they weren't injured, could develop a fear of falling that threatens to limit their activity and make them less mobile. Many families don't realize that this, in turn, could result in a loss of physical fitness and actually increase their risk of falling. At BrightStar, our plan of care includes individualized tasks for exercise to help reduce fall risk based on the RN Falls Risk Assessment and subsequent reassessment and supervisory visits monitor progress. 4. Environmental hazards. Do what you can to improve safety around your loved one's home by reducing tripping hazards, adding grab bars inside and outside of the tub or shower and next to the toilet, adding railings on both sides of stairways and improving the lighting where needed. As one of the only national brands to pursue Joint Commission accreditation for all locations, BrightStar follows National Patient Safety Goals, one of which is on fall prevention with a focus on environmental safety hazards. For more information on evaluating home safety, download our Home Safety Checklist. 5. Chronic conditions. One of the most important ways to reduce the risk of falling in an elderly loved one with a chronic condition is to understand the disease process and help them to follow the treatment plan, get to doctor appointments and know red flag alerts. At BrightStar, we have a unique expertise in chronic conditions through our Clinical Pathways program. Not only are our specially trained caregivers are competency verified to care for people with these conditions, but we have RN oversight on every case. If you are looking for more help and support for a loved one who might be at risk of falling, contact us today for a free in-home assessment to identify key risk factors and provide a comprehensive plan on how to decrease their likelihood of experiencing a fall.